Teaching kids to eat and drink healthfully requires much more than admonitions. After carting away the vending machines and abolishing the Big Gulps, we can't leave the kids empty-handed. 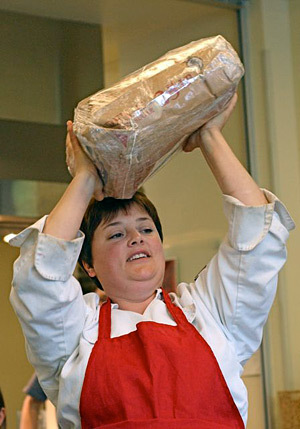 Rachelle Boucher from Generation Chefs is working hard to fill the void. From the popular Pizza Smack-Downs at COPIA to her weekly cooking classes (free to high school students) in the beautifully outfitted kitchen at the Marin Youth Center (MYC a.k.a. "Mike") she's bringing fresh, whole, homemade food generously flavored with reaffirming messages and lots of common sense to a wide and diverse group of kids. 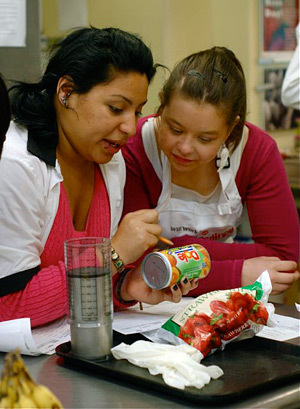 A visit to one of her cooking classes reveals her consummate skill in converting teens to the cause of healthy eating. Endowed with humor, warmth, and endless energy, she's a master of choreographing 25 wary bundles of apathy and hormones into productive teams of excited, skilled, fruit-and vegetable-loving cooks. Rachelle hefts up 20 pounds of refined sugar so the kids can see how much the average American teenager consumes every six weeks. Her class this past week highlighted our favorite fruit of the season--strawberries--along with one very shiny, red bike blender. The lesson for the day involved putting down sugary drinks and sipping fruit smoothies instead. 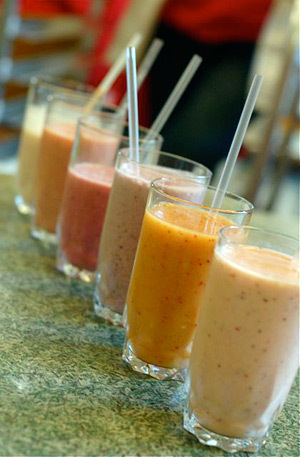 In addition to fresh strawberries, melons, and bananas, the teen chefs could choose from a colorful array of juices, frozen fruit, yogurts, and natural flavorings. Most importantly, they learned that not a single grain of added sugar was needed to create a delicious drink. A rainbow of sweet goodness just before the pedal action. Mike Graham-Squire from the Youth Leadership Institute joined the class to show the teens how to select ingredients, calculate food costs, determine servings sizes and overall yield, and--most importantly of all--operate the bike blender. As representatives of schools and local community organizations, the kids were also learning how smoothies can be a healthful, interactive, and effective fundraising tool at large events. From the Country of Marin's Nutrition Wellness Program, nutritionist Ellen Szakal taught the class how to read product labels to determine the number of teaspoons of sugar in each serving. A chart listing their favorite snacks and a hands--on exercise counting out a disconcertingly large pile of sugar cubes helped them understand just how much unnecessary sugar they were consuming each day. It's a skill adults could use, too. Looking at the Nutrition Facts label on the side of the package, find the number of grams of sugar. Then divide that number by 4. For example, ingesting 65 grams of sugar in a 20-ounce drink bottle (considered 1 serving) means swallowing 17 individual teaspoons of sugar. So much youthful energy, it takes extra hands to hold the jar still. 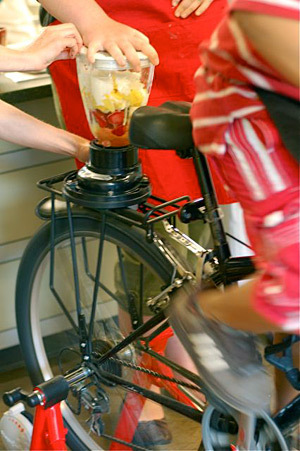 Berkeley-based Juice Peddler sells kits for retrofitting bikes to become human-powered blenders. From the first-generation's endearingly clunky tricycle platform and antique hand-drill to the fifth-generation's sleek, high-density polyethylene design, the company has been at the forefront of DIY bike blender technology. The kids took turns pedaling their fruit concoctions and proudly shared tastes of their icy treats with other teams. Lined up for judging, the smoothies created a rainbow of delicious fun: Monkey Melons, Fruit-A-Palooza, Pink Panther, Go Mango, Fruit-A-Licious, and Pink-A-Licous Strawberry. I'm glad I didn't have to judge, as it would have been a tough call to pick just one winner. Sammy and Brittney confer on the formulation of their team's smoothie. The members of Team Pinkalicious decided to celebrate the happy coincidence of their clothing colors with an appropriately hued smoothie. 1. 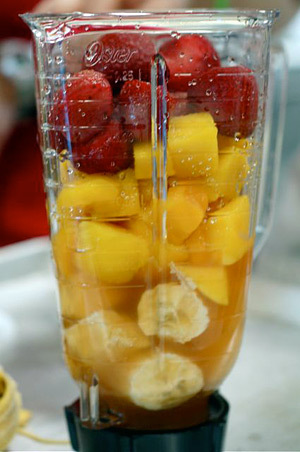 Place all ingredients in the jar of a blender. 2. Blend until completely mixed. Another excellent recipe from Generation Chefs that highlights the current season's bumper crop. 1. Place all ingredients in a blender in the order listed. 2. Blend until completely mixed. Taste and adjust for sweetness or tartness as desired. 3. Pour into chilled glasses, garnish with mint sprigs, and slide a berry onto the rim of each glass.